Enjoy a breakfast that's Control-Alt-Delicious with this geek-chic waffle iron by Chris Dimino. Made from die-cast aluminum and featuring bake-lite heat resistant handles, this design can be put on the grill or even gas or electric stovetops, letting you enjoy gourmet Belgian-style waffles whether you're camping, tailgating, or simply brunching at home--a perfect way to encourage playing with your food, no matter what your typing speed. Features a unique wide format plate that creates a delicious Belgian-style waffle in the shape of your beloved computer keyboard. We've also added a comfortable curved handle for easy flipping. All of this in a simple and sleek design that compliments your kitchen. Just add heat, batter, and toppings! 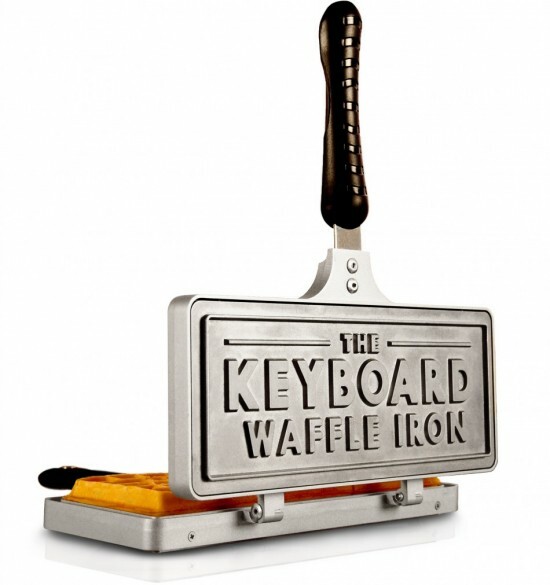 Tell your friends about The Keyboard Waffle Iron! Would you also like to add these products to your cart? Welcome to the store of Messy Desk Design. We have 1 products on sale today.